My daughter saw a message on Facebook last night from a friend. He mentioned that his Dad had recently had some health challenges and asked his friends to keep his Dad in their thoughts and prayers. After she read the message, Alexandra asked if I would please bring a quiche to her friend’s Dad. Of course the answer was yes… and that is why this morning I gathered together ingredients to make a quiche for Mel and his wife. 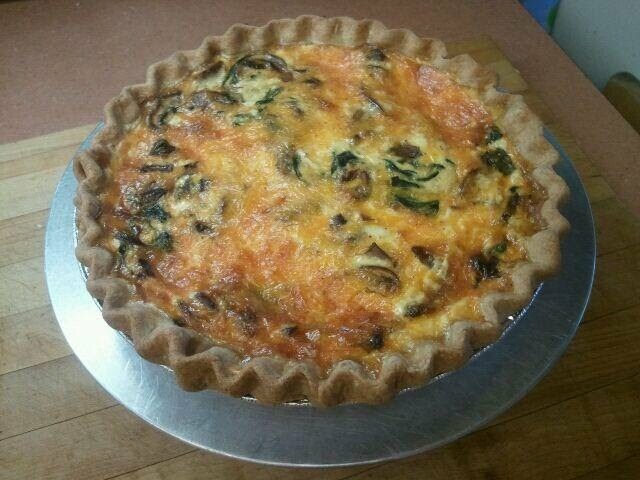 They included beautiful crimini mushrooms, sharp cheddar cheese, spinach and onions. In what seemed like no time at all, the quiche was in the oven and in less than an hour, it was done. Once it was cool, I walked up to Mel’s house and since he was not at home, I left the quiche on a chair on his porch. Later, I called and spoke with Mel’s wife and explained who I was and told her that I was the one who left the quiche. She told me that Mel was doing well and thanked me for the gift. I can’t help but think it was such an easy way to let them both know that we were thinking of them and sending good wishes their way.